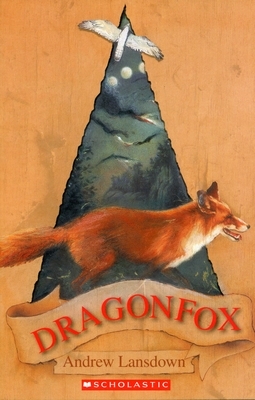 Dragonfox is a fantasy genre written by Andrew Lansdown. This fantasy novel takes you into two worlds of adventure. Colyn is a 10 year old boy who lives with his dad and his dog Kinzar. Colyn’s mother died a few years ago. After having a strange dream about dragons in the other world making a new weapon (knife) called Kinrye, he leaves Narkist, his world, and goes to Klarin, the other world. The dragons have lost the old Kinrye which Colyn now has, so they are making a replacement knife to do evil. Colyn goes through the forests of this weird world and meets Yasni, a girl about his age but slightly taller. They work together as a team to get the new Kinrye out of the hands of the Dragonfox, the king of the dragons, through battles, adventures, arguments and victories. This book will interest readers who love fantasy novels. However, it will not be suitable for readers under the age of ten. This is because the story needs a bit of imagination to understand all the unfolding actions. Almost all the words in this book are understandable and they all make sense. I will give this book a four-star rating. 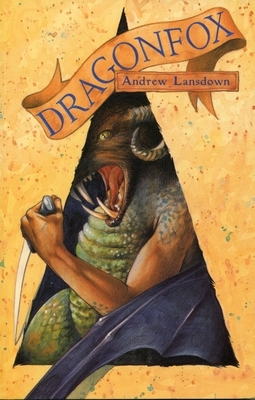 I like this book and would like to read some more of Andrew Lansdown’s fantasy novels. I recommend other readers to read Dragonfox because it is exciting. Colyn’s father nudged the clump of feathers with his boot. ‘Fox!’ he cursed. Kinzar sniffed at the body, then barked. Colyn ran to the chook run. The door was ajar and the ground was strewn with feathers. ‘They’re all dead,’ he called. His father surveyed the carnage from the doorway. Three hens lay under the roost and two more lay against the wire at the back of the run. ‘I forgot to close the door,’ he said, shaking his head. ‘Goes to show how much I need you, eh?’ His frown turned into a grin as he looked from the hens to his son. Colyn smiled back. It was normally his job each evening to shut in the hens, but he had been away on a summer holiday camp and had come home yesterday after dark. Colyn looked past his father, past the farmyard and the potato paddock, to the gums lining the river. He unconsciously fingered the knife in his belt. ‘But I’m the Rykone, the Knife Lord,’ Colyn said. Kinzar yapped and pawed at the pair of them. Colyn whistled Kinzar and set off. Although it would have been shorter to cut straight across the paddock, he walked along the gravel road to where a large white gum had been uprooted during a storm. It lay across the fence, its withered leaves hanging in heavy clusters towards and upon the earth. He climbed up the roots and onto the trunk. It was so wide that he could walk along it easily, without holding his hands out for balance. The cracked bark crunched under his feet. He crossed the fence line and walked down a large branch as if he were walking down a steep narrow ramp. On the ground again, he noticed the entrance to a small tunnel in the drooping leaves. He stooped to peer in and found that it branched in several directions. A rank odour wafted from the opening. ‘Aw, pong!’ he said, crinkling his nose and straightening up. Kinzar joined him, sniffed about the tunnel entrance, barked wildly, then rushed in. As he did so a fox burst out of the leaves at the head of the tree. It streaked across the paddock, its bushy tail streaming behind it like a wind-sock in a gale. Kinzar gave chase, but he was too far behind to catch up. Instinctively, Colyn snatched his knife from his belt, took hold of it by the blade-tip, and hurled it with all his might. He had never thrown it before, so he was taken by surprise at the way it sped smoothly from his hand. It spun blade-over-handle with such speed that it made a shimmering circle in the air and closed on the fox with unerring accuracy. Sensing danger, the running fox turned its head to the spinning knife. But it was too late to evade the blow. The blade slipped between its ribs and rammed in to the hilt. The fox reeled and fell. As it did so, a second fox broke from hiding in a burnt-out log and dashed to a heap of stones at the edge of the paddock. Kinzar veered after it. Then the first fox struggled to its feet and began to stagger towards the river. ‘Oh!’ Colyn cried. ‘Oh no!’ He was so horrified to see the wounded animal stumbling across the paddock that he was momentarily rooted to the spot. In all the excitement it had never occurred to him that he might actually hit the fox. Nor could he have guessed that his knife might not kill its victim instantly. Now he would have to track the animal down and put it out of its misery. He shuddered at the thought of how he might have to do this. As the fox neared the bracken and bushes that lined the riverbank another horror dawned on him. The fox was escaping with his knife! The Dragon Knife, the Kinrye, was about to be lost! Crying out in alarm, he lurched into motion. He ran with all his strength, and yet his legs seemed strangely leaden and his progress uncannily slow. He felt as if he were running in water in a dream. It seemed an age before he covered the distance between the fallen tree and the riverbank. He stood panting at the place where the fox had entered the bushes. It was nowhere to be seen. His heart was beating furiously with exertion and anxiety. He looked about wildly, snatching at leaves, kicking at stones, thrusting his way through the undergrowth. He thrashed about in one direction, then another, but without success. It was hopeless. The fox was gone, and with it his knife. Gone, lost! He sat down and began to sob. In his despair he imagined all sorts of disasters. He imagined the fox crawling into a secret lair, where it would die and remain forever hidden. The knife and its power would be lost to him as long as he lived. Never again would he be able to make the magical stones that sped so fast. Never again would he be able to make a carving like the one that had mysteriously summoned Kinzar to his own world. Never again would he be able to make a doorway to enter Klarin, the otherworld, where the Kinroan warriors had called him Rykone, Knife Lord. Never again! Then, after he had finished imagining his loss he began to imagine his danger. He saw the fox escaping into the otherworld, into Klarin, where it summoned the dragons with a sharp bark. The dragons gathered around it in triumph. They withdrew the knife and healed the fox. Then the fox became a dragon and Colyn suddenly realised that he had been tricked. He had thrown the Kinrye not at a fox but at a dragon, a dragon in the shape of a fox. A foxdragon. A dragonfox. By one impetuous act he had condemned himself and betrayed two worlds. It was Kinzar who finally roused him from his trance. The dog whined and licked his face, then licked him again. He stood up and began to do what he should have done at the outset. He began to search the ground carefully in ever widening circles. Before long he found a spot of dried blood. ‘Here, boy!’ he called, patting his leg. Kinzar trotted over and sniffed the blood. He became excited and nosed about for more. Then, in spite of Colyn’s earlier tramplings, he picked up the fox’s scent and began to track it down. The fox lay beside a log barely a hundred metres away. It was dead, and its body was already cold and stiff. Colyn pulled his knife from its side and took it down to the river. He washed it carefully, running his forefinger and thumb along the flat of the blade and around the base of the handle. The weapon cleaned up easily and completely. Colyn wiped it on his shirt, then turned it over in his hands. How beautiful it was, the Kinrye, the Dragon Knife, with its long thin slightly-curved blade that gleamed blackly like polished basalt, and its smooth brown wooden handle etched with a circle on one side and a triangle on the other. ‘My knife,’ he murmured, slipping it through his belt.